Experience our fast, reliable service. A Federal Emergency Management Agency (F.E.M.A.) Elevation Certificate is a document that presents survey data that may reduce the need for or cost/rate of flood insurance for a specific property. An individual who owns, rents, or leases property may find that their property is located in a flood zone per the Flood Insurance Rate Map, (F.I.R.M.). The F.I.R.M. is the official map of a community on which F.E.M.A. has delineated the flood zones applicable to the community. F.E.M.A. 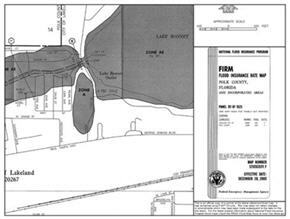 has determined these flood zones using field survey data, historical records and aerial photographs. In many cases the Licensed Land Surveyor can prove in the field that your home/structure is at an elevation that is above the flood elevation determined by the F.I.R.M. The surveyor will fill out the elevation certificate showing F.I.R.M. elevation compared to the elevation of your home/structure. This information will then be used by your insurance agency to determine the need for or the cost/rate of your flood insurance. The F.E.M.A. 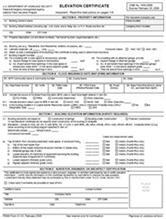 elevation certificate must be filled out and signed by a surveyor, engineer or architect. Here at Rapid Surveying we will field verify elevation, be in contact with local agencies, and fill out the elevation with a professional approach. This will give you the best document for your insurance agency to make a quick and exact determination for the need for or cost/rate of flood insurance. On this website page we have included the first page of an elevation certificate and a single area map of a FIRM. These views are for reference only. Our links page has website links to the complete documents and FIRM maps for your review.